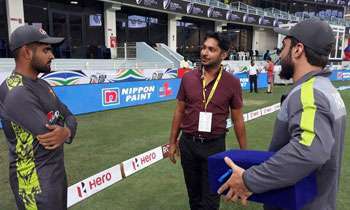 Sri Lankan legend Kumar Sangakkara has given some key advice to Pakistan’s rising stars Babar Azam and Usman Khan Shinwari as Men in Green prepare for the highly anticipated clash against India, the Pakistan media reported. Pakistan and India will lock horns on September 19 at Dubai Cricket Stadium for the first time after ICC Champions Trophy final last year. This is also the first meeting of the two sides on the UAE soil since 2006. Following Pakistan’s crushing victory over Hong Kong, the legendary batsman came on to the field and gave some key advice to Babar and Shinwari. According to the Pakistan Super League’s (PSL) official twitter account, the batsman told Pakistani duo to stay calm and control your nerves ahead of the clash. Very nice. Share your knowledge with the people who want to learn, respect your knowledge. Migrate to a country where cricket still exists. Dear Sanga, 'charity begins at home' is the saying! This is the Sanga some people thought ideal person to become a Sri Lankan President. I personally believe Sanga and Mahela retired little too early. They still have a plenty of cricket to offer in them. The vacuum created by these two legends will be very hard to fill. Other than Mathews, no one else in the team is performing consistently at the moment. They both should have stayed to see through the transformation happening smoothly. Too late now. Sanga after advising the Pakistanis be careful when you return to Sri Lanka as Sri Lanka is filled with Indian RAW operatives. Please take extra care. Sanga and Mahela always shined and didn't help youngsters come up. Else it would have been a smooth transition when others took up their places. It's like some people who leave the job without proper hand over just to see how others praise them when the company work gets messed up due to their absence.